For the new SS26-Disc we have taken the very best elements of the original frame and reconfigured the geometry to make this bike perfect for all day riding and endurance sportive events. The frame is fully optimised for new flat mount hydraulic brake systems and features 12mm front and rear axles. The large BB shell coupled with the oversized headtube and downtube, offer excellent cornering, as well as high-level impact and vibration absorption, all of this without sacrificing weight or stiffness. The SS26 takes its name from the picturesque road that links the Italian and French sides of Mont Blanc in the Aosta valley. Brought to fame by the opening sequence of the cinematic classic The Italian Job, where the Lamborghini Miura meets a dramatic end. 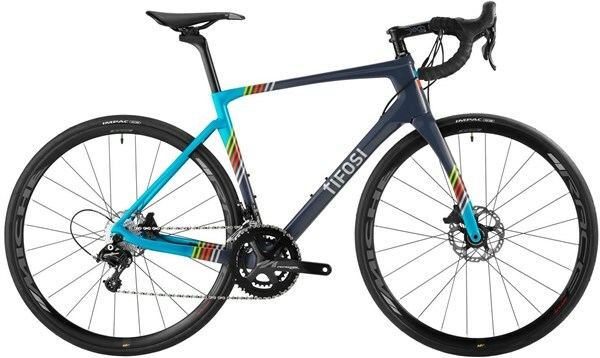 Whether you’ve just entered into the world of road cycling, you’re a casual sportive rider or an amateur racer; the SS26 has a combination of features that make this your ideal bike. FLAT MOUNT: The SS26 utilizes the Flat Mount system with 12x142mm Rear axle and 12x100mm Front axles for a perfect 160/140mm rotor combination and superior braking in all weather conditions. FLATTENED STAYS: Using a flattened seat stays, the new SS26 improves the ride quality of its predecessor. BOTTOM BRACKET: The wider 86.5x41mm BB shell increases the SS26’s stiffness under pedalling loads. ELECTRONIC GROUPSET READY: The SS26 is compatible with all brands of hydraulic electronic groupsets should you wish to upgrade the components. CARBON CONSTRUCTION: Using a blend of Toray Carbon fibres, the SS26 is a perfect combination of strength, stiffness and weight. TAPERED HEAD TUBE: A tapered head tube adds additional strength and high torsional stiffness to the frame as well as providing pinpoint steering accuracy. Fork: Carbon UD 1-1/8" to 1-1/2"